Born on 2 July 1894 in Honesdale, PA, David McKelvey Peterson worked at the Curtiss plant in Buffalo, NY following his graduation from LeHigh University. Taking flying lessons in his spare time, he left for France in October 1916 to enlist in the aviation service and received his brevet on 23 April 1917. 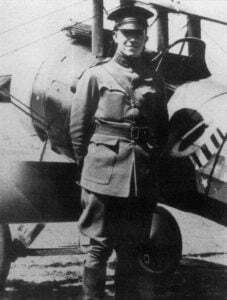 Assigned to the L’Escadrille Lafayette in June, flying SPAD VIIs, Peterson scored his first victory on 19 September when his flight encountered six Albatros scouts along the Meuse. Peterson was the first to attack, downing one of the German scouts. In mid-January 1918, Peterson transferred to the USAS as captain. Initially assigned to the 103rd Aero Squadron on 18 February, on 1 April he was transferred to the 94th Aero Squadron. Assigned as a flight leader, he led the first all-American patrol with Eddie Rickenbacker and Reed Landis on 14 April. On 3 May, Peterson’s flight engaged several German aircraft near Amenocourt and he downed one of the Germans for his first victory in the 103rd. Twelve days later he shot down two Rumpler observation planes in less than five minutes over Thiacourt. Peterson was transferred to the 95th Aero Squadron on 16 May and became an ace the net day with a victory over an Albatros two-seater near St. Miheil. He was promoted to major in August and commanded the 95th before being ordered back to the States for instructor duty. While serving as commander of aerial gunnery at Carlstrom Field, FL, Peterson initiated the USAS’s first night flying program. He was killed in a flying accident at Daytona Beach on 9 March 1919.